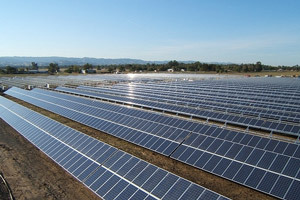 California has been ground zero for solar development in the U.S., and we’ve chronicled many mega projects – particularly those with federal funding – that are set to materialize in rural counties and deserts and stretch the length of several football fields. However, solar energy still accounts for only a tiny amount of the state’s renewable energy mix today. But that picture will change dramatically in less than a decade. California requires utilities to get 33 percent of their power from renewable sources by 2020. Lawmakers set the mandate in 2002, and they tinkered with it a few times since then. Regulators and renewable energy advocates expect the state to set even higher requirement beyond 2020. Projects that use photovoltaic (PV) panels only started competing for contracts with utilities in 2007, according to a state report. Yet PV is set to dominate by 2020, at least for the state’s largest utility, Pacific Gas & Electric. Big price declines over the past two years have made PV much more attractive than solar thermal (which uses the sun’s heat), prompting many solar developers to switch to PV. 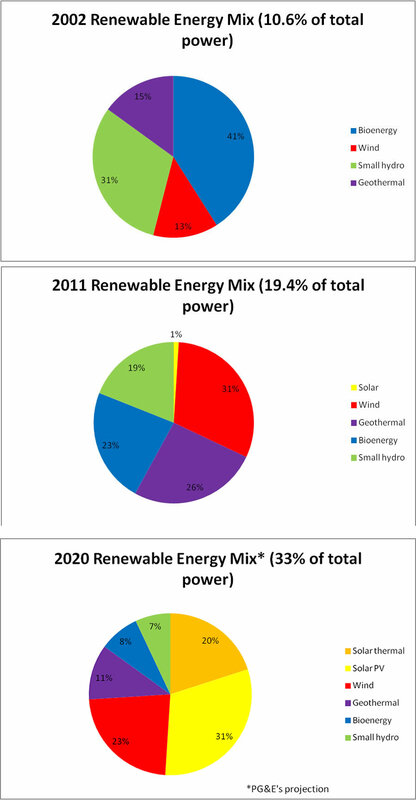 We’ve created three charts that show the progression of renewable energy mix for PG&E over time and as a percentage of the utility’s overall power supplies. The numbers, provided by Steve Malnight, a vice president of PG&E, during SolarTech’s conference in San Jose Wednesday, represent the amount the utility buys and sells to customers in order to meet the 33 percent goal.